Has anybody seen my boat? “If you find a boat in your living room, can you keep it?” my cousin the lawyer asked. “If you found a car in your living room, could you keep it?” I asked back. Good rule of thumb for boats and golf balls. This entry was posted on October 24, 2008, 4:30 pm and is filed under The Storm. You can follow any responses to this entry through RSS 2.0. You can leave a response, or trackback from your own site. Isn’t it strange how our precious belongings, be it an old doll, your comfy sofa or your pleasure boat can so quickly become “debris” to the rest of the world? When I see the piles of debris on the island and around Houston, I am reminded that it is not trash or debris, it is a mountain of dreams and treasures of a lifetime, of many lifetimes. Thanks for the blog, your care, humanity and the humor as well. Keep on bloggin!!! Living on Tiki Island, I can relate to this discussion. When we returned, what appeared to be a shrimp boat was lodged between two homes on the south side of the island. It was stuck, hanging in the air, up to the second floors of the homes . . . guess that’s where the water was when it got stuck, but then the water receded, and left it there. An unbelievable sight. 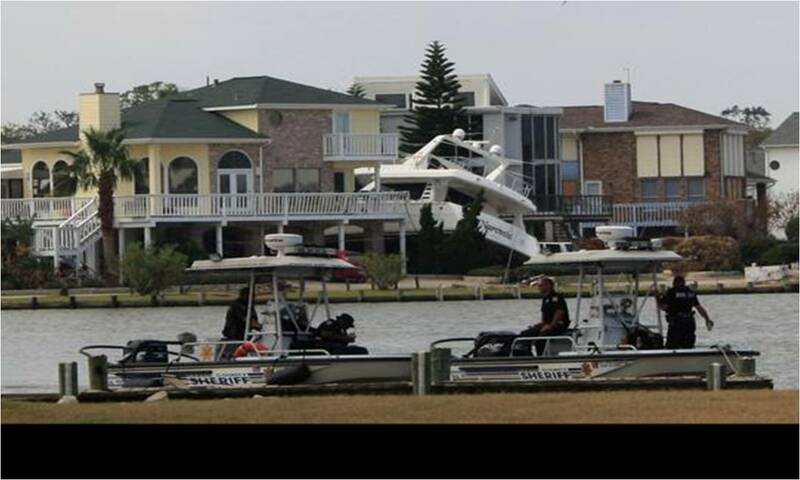 Thankfully, most of the boats and jet skis scattered in the yards of neighbors just landed in their yards. It brought back memories of life after Hurricane Carla, which came through years ago when I was a child growing up in the nearby Lake Jackson area. We evacuated, then returned to find someone’s boat in our front yard. We put up signs and placed ads in the local newspaper, but no one ever claimed it, so we eventually started using it ourselves. Which begs the questions: Is there a time limit during which you are expected to let the car remain in your living room? (smiles) . . . And if you pull it out so you can repair the damage, and the car still works, how long do you store it waiting for the owner to claim it, before it becomes yours? Or conversely, is there a boat “Lost and Found” somewhere that we should be taking unclaimed boats to? . . . If so, there are still several boats along I-45 that are ready to go. They were an amazing sight for a while, but now they are just becoming a new form of roadside trash. Do they have to be left by the side of the road forever? I certainly hope not! I heard last night that there was some debate over whose responsibility the debris on I-45/Broadway is. As you know, I-45 becomes Broadway @ 61st Street. Since I-45 is a State highway, some are saying it is the State’s job to clear it. But Broadway belongs to the City, so…??? The loopholes can make you loopy! Here are some photos of a particularly unlucky boat next to I-45 and Payco Marina. She was a great little vessel and we loved to ski with her. She was totaled. RIP Challenger X.
I’m curious, Amy. Now that you found your boat, is your insurance company more or less inclined to pay replacement value?